"'No, you must believe me. It was a horseman, a dead one. Headless." 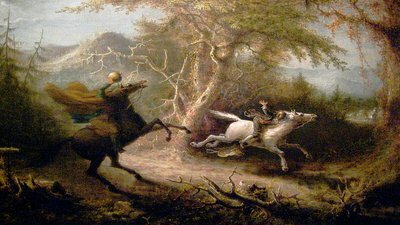 The story of the Headless Sleepy Hollow Horseman and Ichabod Crane, an educator from the State of Connecticut, is hailed by many as one of the most popular urban legends throughout the world. This urban legend originates from a fictional short story created by the American Author named Washington Irving, titled, “The Legend of Sleepy Hollow”, which is contained in his collection book entitled, “The Sketch Book of Geoffrey Crayon, Gent”. While the Sleepy Hollow Horseman originated as a fictional character, many individuals throughout history have claimed that they have observed the headless paranormal entity in various regions of the world. Most that have read the story by Irving feel that it is based on some degree of truth – especially those that have eye witness accounts of this terrifying entity. It is a known fact that all urban legends are based on some degree of truth. Is the Sleepy Hollow Headless Horseman real? We will let you decide. In this guide, we will be covering of the greatest unsolved mysteries of all time – the one that describes the correlation between the Headless Horseman and Ichabod Crane. The Sleepy Hollow Headless Horseman originates in the Village of Sleepy Hollow, which is located in Tarrytown, New York and is part of Westchester County. Originally, this village was called “North Tarrytown”; however, in the year of 1996, the residents elected to change its name to honor the story, “The Legend of Sleepy Hollow”, by Washington Irving. In this village is the popular, “Sleepy Hollow Cemetery” where the famous American Author named Washington Irving, is buried. In addition to this, there are several other notable individuals that have been laid to rest in this historic burial ground, which was included on the registry called, “The National Register of Historic Places” in the year of 2009. These individuals include – but, are not limited to – Andrew Carnegie, Walter Chrysler, George Jones, William Rockefeller, Elizabeth Arden, and Francis Pharcellus Church. The Sleepy Hollow Headless Horseman is believed to be a male German soldier from the eighteenth century. During this period of time, these soldiers were often called, “Hessians”. The Hessians were hired directly by the individual rulers that were part of or associated with the British Empire. While the Hessians fought in numerous wars and conflicts, the majority of the battles that they were part of were directly related to the American Revolutionary War. During this war, a fight took place which is referred to as either, “The Battle of White Plains”, or, “The Battle for Chatterton Hill”. During this fight, at least fifty different Hessians lost their lives. It is believed that the entity known as the Sleepy Hollow Headless Horseman was one of the individuals that lost his life. According to information passed on throughout history, this individual was killed when the Americans shot a cannon. It is believed that the cannonball emerged from the weapon and then hit him and severed his head. Once the fight was completed that resulted in the death of the Hessians, clean-up efforts began. The soldier with the severed head was found and then put to rest in a local graveyard that was near the outside of the churches that were located in the region. According to locals, the Headless Horseman never rested. Not too long after the decapitated soldier was buried, individuals that lived in the region started reporting unusual sightings that appeared to be the Hessian soldier’s spirit. The descriptions of the paranormal entity included the fact that he was dressed like a soldier, he rode on a dark-colored horse, and his head was resting on the back of the horse as he rode it. Those that witnessed this malicious paranormal entity often described feeling anger, and that they were in danger. Those that have presumably come in contact with this angry spirit stated that he uses his head as a weapon against the living. Many reports claim that the Sleepy Hollow Headless Horseman carries a sword, while others claim that he carries an axe. In order to gain a full appreciation for the Headless Horseman urban legend, it is important that you are introduced to the educator from Connecticut, named Ichabod Crane. It is said that this particular schoolmaster was highly superstitious. The man often traveled from one location to another in order to provide an education to the children of the farming families. He often shared tales of witchcraft, cults, and legends on his travels. It is said that he eventually took a liking to a woman named Katrina Van Tassel. Katrina was an exceptionally beautiful eighteen year old daughter of a farmer that had experienced a great deal of wealth in his lifetime. It is said that Katrina’s parents found Ichabod Crane exceptionally appealing and fully supported the fact that he was courting their daughter. Unfortunately, Ichabod Crane had competition for the affections of the young lady. The other individual pursuing the young woman was named Abraham Van Brunt, who was commonly referred to among the locals as “Brom Bones”. He was given this name by the locals because of the fact that he had a physique that was Herculean in nature. He was widely popular among the town for several reasons. He was often displaying his immense strength throughout the town, he often engaged in pranks that were considered to be a bit on the wild side, and he was considered to be extremely reckless as far as his horseman abilities were concerned. However, despite the fact that Abraham Van Brunt was quite the character, most individuals throughout the town viewed him in a favorable manner. Abraham eventually learned that Ichabod Crane was making advances toward Katrina. Under normal circumstances, there would not have been an issue with this. However, Abraham also wanted to draw the attention of this female. One night, there was a party at Katrina’s house. Naturally, Ichabod Crane and Abraham were invited to the event. The evening eventually progressed to the point where Ichabod Crane was given the floor to share his superstitious tales. Upon doing so, he elected to share the story of the Headless Horseman. Later that night, it is believed that the Sleepy Hollow Headless Horseman approached Ichabod Crane on his ride home. The next day, the man was missing but his hat and other belongings were found next to a pumpkin. Many believe that the Headless Horseman that Ichabod Crane encountered was a prank by Abraham, who threw a pumpkin and made him believe it was his head. Others believe that Crane was taken by the horseman. Still, there are some that believe that Ichabod Crane survived and moved immediately to another region because he feared that what he encountered was the true Headless Horseman. While it is true that the Headless Horseman is part of a fictional story, there are still many that actually believe that this story is based on real experiences. Whether or not the story of the Sleepy Hollow Headless Horseman is fact or fiction is considered to be one of the greatest unsolved mysteries of all time, but several still search to uncover the truth of this mystery. However, for those that have personally witnessed this malicious paranormal entity, there is absolutely no doubt, whatsoever, of whether or not the Headless Horseman Sleepy Hollow legend is a real entity.